Glenn Costie (left) is shown with Rotarian Walter Harrison, a dedicated advocate for our military veterans. 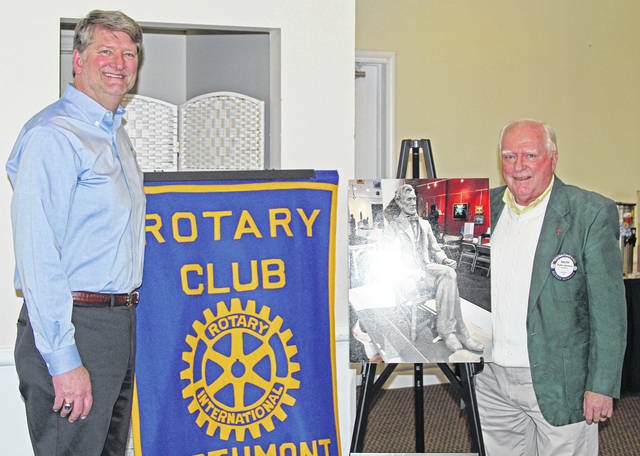 CLAYTON — The Northmont Rotary learned about the American Veterans Heritage Center recently from its President Glenn Costie. With the signing of such legislation in March, 1865, Lincoln established in Dayton the first of three National Homes for Disabled Volunteer Soldiers. This organization grew and ultimately became the Veterans Administration, of which one its divisions remains as originally charged with the care of our American veterans. The American Veterans Heritage Center is a non-profit corporation dedicated to honor the accomplishments of veterans while preserving a priceless piece of national and local history – the Soldiers Home located at the VA Medical Center in Dayton. The AVHC is not a government agency nor affiliated or supported by the Federal Government. The scope of its activities include historic preservation projects, events, tours, and a festival, “The Patriot Freedom Festival,” which is held annually on the weekend before Memorial Day at the Dayton VA for the benefit of the on-campus as well as off-campus veterans, their families, and the community.